﻿ Sculpted figure running with boar [The Death of Adonis by Giuseppe Mazzuoli] in Hermitage Museum. Sculpted figure running with boar [The Death of Adonis by Giuseppe Mazzuoli] in Hermitage Museum. 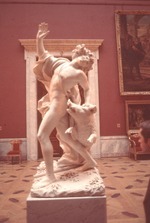 Sculpted figure running with boar The Death of Adonis by Giuseppe Mazzuoli in Hermitage Museum.